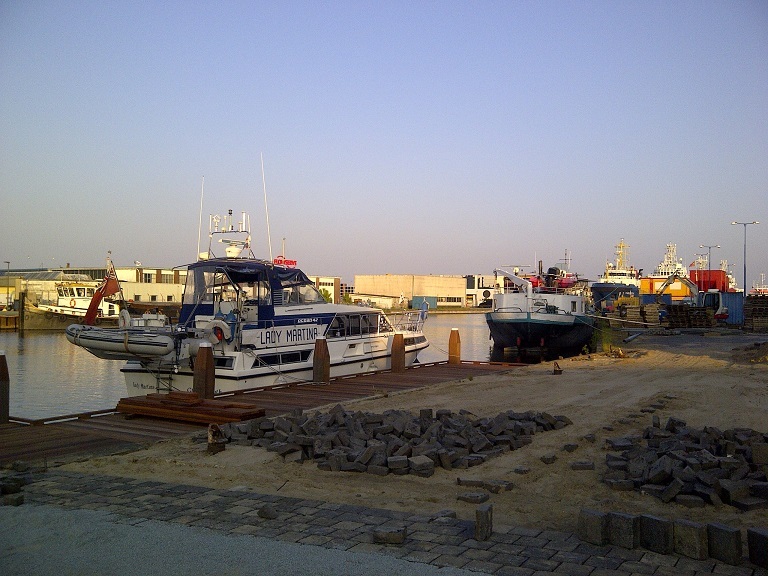 I was first awake, up and dressed around 7am and was therefore around in time to see the Beverwijk workmen arrive. It was interesting to watch then as I made my morning tea and I could see them laying paving bricks around the new moorings. Later on, a group of people led, I believe, by the harbourmaster came to look at the work and when I called him on VHF 71 later to leave the harbour, he told me that we were the very first vessel to use them. We would also be very welcome anytime and he hoped to see us again! I think that I can take a little credit for this as we visited here in 2006, sketched the harbour and made notes in our book and, at that time, the harbour were embarrassed not to have better facilities for visitors and I reckon that now his wishes have been met my the municipal authority and they could see from our visit that they would be a success! 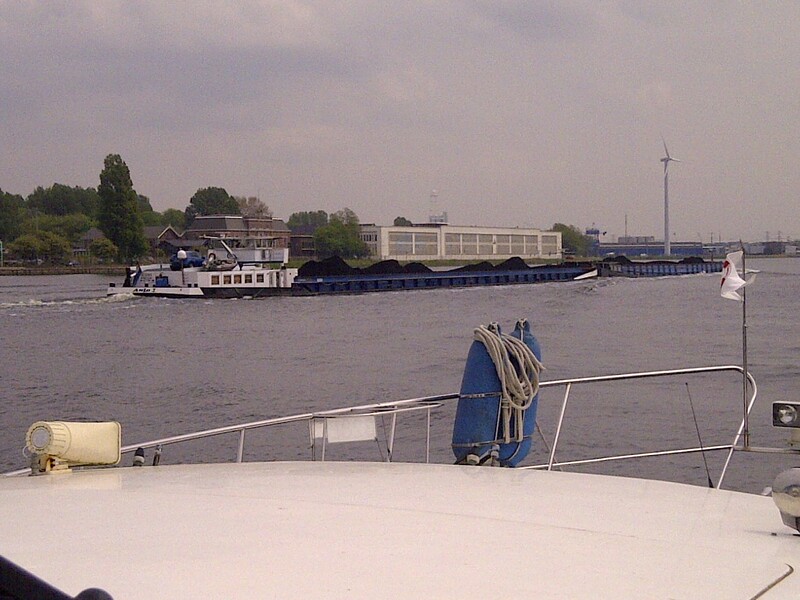 We cruised out of the side canal onto the main one and then along to Amsterdam. 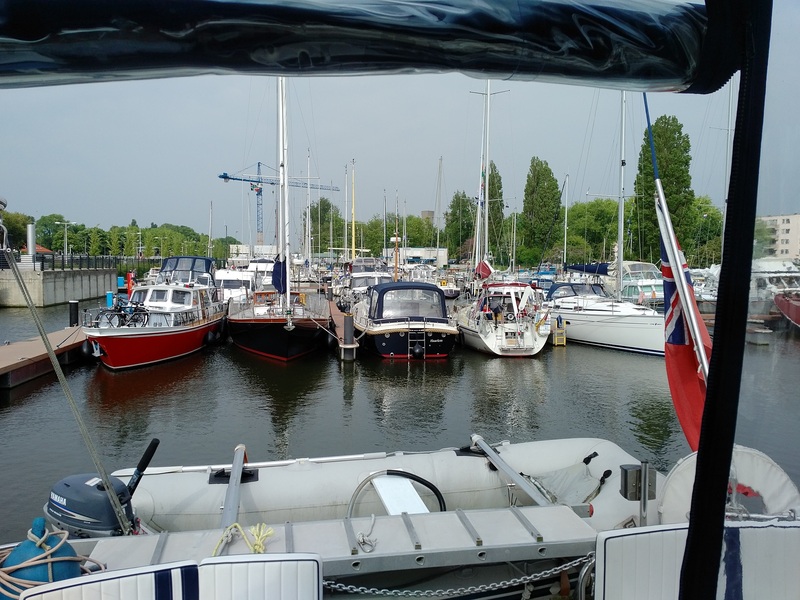 We had tried to phone Aeolis and established that there was no space there and so we cruised along past Amsterdam Marina (which is too big, expensive and impersonal) and in to the old Sixhaven marina. It has retained its charm but has had its facilities greatly modernised and we were accommodated on a very commodious pontoon for just €25 for the night with free electricity, WiFi but with a €1 charge debited from our prepiad services card for metered water. Once we had settled, I got out the folding bikes and assembled them and then we took a ride around the area and across on the ferry from IJplein to central Amsterdam where we made our way to the tourist office so that I could buy two ‘anonymous ov-chipkaart’ travel cards. Rather like to UK Oyster cards they can be used for bus and train travel anywhere in The Netherlands and so I charged them with €35 each and then took them across to the railway ticket office to get them validated for train travel too. Next was the need to get our local Dutch Sim cards working for calls between us in The Netherlands and for use of local Data for surfing whilst we are here. I now have the local number 0646 274 464 (or +31 646 274 464 from the UK) and Kathleen's is 0687 941 164 (or +31 687 941 164) which will be answered once we have ended our period of 'shore leave' and returned by car and ferry (with dog Max!) on Wednesday 25th.